"These make a simple, delicious, and elegant appetizer. They impress every time!" Preheat oven to 400 degrees F (200 degrees C). Line a jelly roll pan with parchment paper. Arrange tart shells onto prepared pan. Put a piece of Brie cheese into each shell. Sprinkle diced pear and a couple thyme leaves into each shell and drizzle with honey. Bake in preheated oven until cheese is melted and tarts are golden, 12 to 15 minutes. 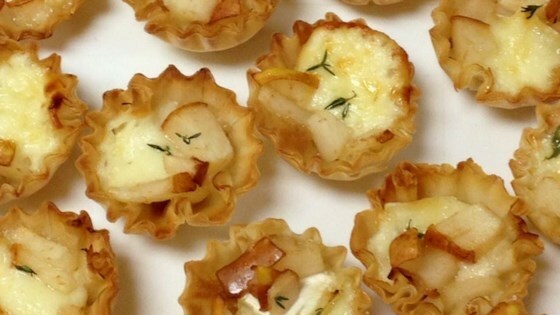 Try this simple cheese and fresh pear party snack. it was very easy to make and pretty tasty, if somewhat mild in flavor. I will defiantly make these again, but most likely add a second fruit with a bolder taste like fresh cherries or pecans. Excellent as written! Also good with a small slice of smoky link/smoked sausage added! Try it like that sometime! A huge hit at Christmas brunch. I made it exactly as written and then added a drizzle of a flavored balsamic vinegar. I am giving this 5 stars based on the speed that these were gobbled up at a multi-Family Christmas party. Teenagers raved, multiple recipe requests. So easy! Walmart/Target have the premade tiny shells to use and super easy from there. Everyone LOVED this IF you love blue cheese!